Each day the mankind is generating quintillions of data. These data arrive from sensors, social media posts, digital cameras, mobile phones etc. These huge amount of data is highly varied and complex in structure and therefore hard to analyze using traditional computing methods. We call this as big data. Industries have understood that analyzing this big data will give them valuable insights to develop their businesses in various ways. Today Big Data has become the hottest topic among industries. Data engineers are being offered most attractive salaries now-a-days. Having understood the importance of Big Data concept the IEEE Student Branch of Annai Vailankanni College of Engineering, Kanyakumari, decided to organize a one day hands on workshop on Big Data technologies to the students. The workshop was conducted on 28th August 2017. 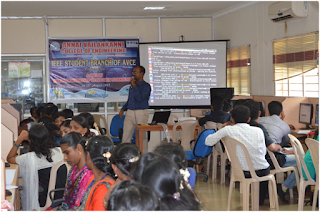 Eighty two students from various colleges participated in this workshop. 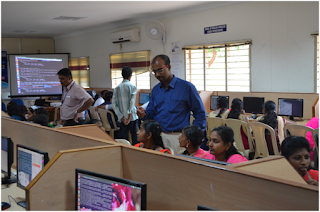 Praveen Jesudhas, Senior Data Engineer from Tiger Analytics, Chennai provided hands on training to the attendees. The workshop was convened by Mr. G. Gaswin Kastro, HOD/ECE & IEEE SB Counselor and Mr. Pearlson David, Assistant Professor, Mechanical Department.